So I know I'm a little late to the party with this one but I finally got the chance to try out OPI's newest nail polish trend! Liquid sand creates a gritty sand-like texture on your nails and dries with a beautiful matte finish. 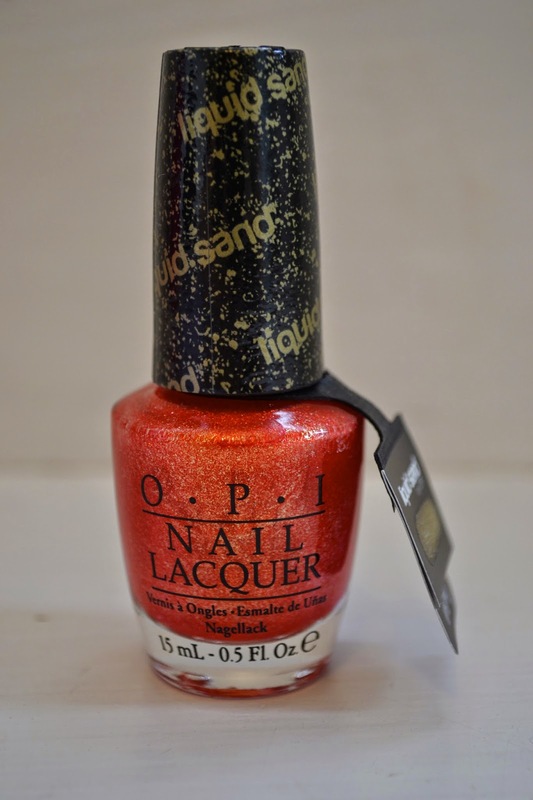 Jinx is a bright coral-orange colour that was part of the OPI Bond Girls collection back in 2013. I originally passed on the colour because I was unsure of the texture, but have since realized I actually like the contrast to my normal smooth and glossy manicures and was so glad I was able to find a bottle in the states. I applied two coats of Jinx overtop of Sally Hansen's diamond shine base and top coat but skipped the top coat. One coat of Jinx was almost opaque but a second coat was needed for a complete opaque look. The removal of the liquid sand polish was quick and easy, unlike glitter polish to my delight! I love the look of this polish for summer and I think it would look great on many different skin colours.